Creation of the Sea believes that saltwater aquariums are essentially “therapeutic displays” that promotes relaxation, and our saltwater aquariums, in particular, are considered by many to be the most tranquil in the marketplace. Studies and research have shown that viewing aquariums can help relieve stress and lower blood pressure, especially in the elderly. In the APPA 2009-2010 National Pet Owners Survey, the foremost benefits of owning a saltwater aquarium included relaxation, stress reliever, better health for owner and family, and quietness. According to this study, these important benefits associated with owning saltwater fish have remained the same over the past decade. Another study conducted by the National Marine Aquarium, Plymouth University and the University of Exeter concluded that fish tanks lower blood pressure and heart rate. You can read more about this study here – The Telegraph Article: Fish Tanks Lower Blood Pressure and Heart Rate. Other studies have reported that viewing an aquarium reduces stress and lowers diastolic blood pressure in the elderly (1,2). In one particular study, aquarium observers in elderly care facilities experienced a decrease in pulse rate, increase in skin temperature, and decrease in muscle tension (3). Therefore, one can conclude that the tranquil setting of an aquarium can serve as a form of therapy for the elderly. Also, researchers at Purdue University have concluded from studies that the nutritional intake and weight of Alzheimer’s Disease patients increases significantly when fish aquariums are introduced into their dining areas (4). Purdue studies have also concluded that there is a noticeable decrease in physically aggressive behaviors among patients living in elderly care facilities with aquariums. It was discovered that decreased aggressive behaviors were due to the patients’ interest in viewing their facility’s aquarium during the day. The patients were viewing the aquarium for up to 30 minutes most of the time, which is a relatively long time for many Alzheimer’s patients. Dr. Nancy Edwards, one of the researchers involved with these Purdue studies, reported that “Often long-term care environments do not offer a lot of stimulation, but fish move around in various patterns, so there’s enough variability to keep patients’ interest. Placing fish tanks in nursing homes may help cut health-care costs by reducing the need for nutritional supplements and for medications given to help calm disruptive patients.” (4). Another Purdue study examined the effects of the presence of an aquarium on patients awaiting electroconvulsive therapy. The study showed that the patients demonstrated a 12% reduction in self reported pre-treatment anxiety (5). In addition, there are studies confirming that watching fish in an aquarium can be effective in reducing anxiety in patients awaiting dental surgery (6). Furthermore, some medical surveys point to the fact that doctors have experienced shorter consultation times, as a result of the tranquility experienced by their patients viewing a saltwater aquarium in their medical office waiting rooms. While viewing the aquarium as they wait to be seen by their doctor, patients are comforted and begin to feel at ease. In recent years, owners of companies from many different vertical markets are passionate about having saltwater aquariums in their offices to provide their employees with a serene working environment. Their intention is not only to alleviate stress for employees, but also to give them a more enjoyable place to conduct their work. Another nationwide survey conducted by the APPA revealed the many different health benefits associated with the presence of an aquarium in the workplace. This particular study indicated that aquariums improve an employee’s morale and productivity. It also stated that aquariums helped employees lower their blood pressure and stress levels, and improved their physical and emotional health. As a result, employees that had an aquarium in their office were happier, healthier, and more motivated and productive. One hundred (100) percent of the companies that participated in this APPA nationwide survey stated that having an aquarium in their office relaxed employees, seventy-three (73) percent reported that an aquarium in the office created a more productive working environment, and twenty-seven (27) percent reported a decreased absenteeism rate. Relaxation, relief of stress, and tranquility are just some of the primary health benefits one can receive by owning a Creation of the Sea aquarium. Another health benefit that a Creation of the Sea aquarium provides comes in the form of education. A saltwater aquarium ecosystem and its inhabitants maintain great health and flourish when the pH level is between 8.2 and 8.4. It is extremely important to maintain this pH level in a saltwater aquarium at all times, as it signifies the maturity and purity of the ecosystem. Maintaining an alkaline pH level/value in the human body is just as important. The same principals apply for maintaining a healthy saltwater ecosystem as they do for maintaining a healthy body, as achieving a slightly alkaline pH level/value (e.g., the ideal 7.365 level) or higher in one’s body is important for his or her optimum health. As already stated on the Medicine web page, Creation of the Sea teaches its clients that it is very important to maintain a good quality of water, salt and minerals in both a marine environment and the human body. Water, salt and minerals are proclaimed by Creation of the Sea and many types of doctors to be the “essentials of life”. Without these life essentials, all life on Earth would cease to exist. Our company uses these life essentials to help create and maintain our all-natural saltwater aquarium systems, and provide them as natural medicinal substances or alternative medicine to benefit the health of both people and animals as well. In addition to enhancing people’s health, saltwater aquariums can fulfill the needs for art, entertainment, exploration and other areas of education. They can easily complement the elemental designs of a home or office. The display of living art in residential and commercial sites is considered by many to be the new trend in design. 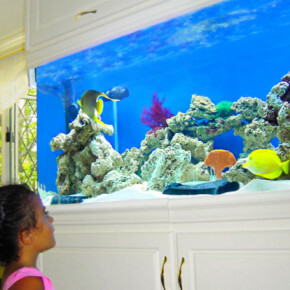 A person, especially a child, can also experience great joy and entertainment by viewing and/or exploring the oceanic environment in a saltwater aquarium. 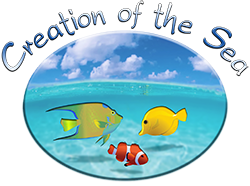 A Creation of the Sea saltwater aquarium, in particular, teaches other areas of educational subjects that range from pre-historic times to the modern era, and include Earth Science, Marine Biology, Geology, Evolutionism, Creationism, and environmental protection. In regards to Geology, our saltwater aquarium can provide people with a great opportunity to learn first hand about some of the elements found in the sea and on land. People can also learn about the origin and makeup of these elements, and their importance for sustaining the life of sea organisms. Saltwater aquariums can teach people about Marine Biology as well. One can learn a lot about the variety of saltwater fish, invertebrates, and algae that live in the sea. He or she can also learn how each species is unique in appearance, behavior and purpose, which could be a fascinating discovery. They can easily became fascinated and amazed at the vibrant colors and intricate patterns of these marine animal and plant species, as this display of “living art” is considered by many to be awesome. The awe could continue to grow when our clients discover that a Creation of the Sea aquarium is naturally filtered and operated. Our methodology for naturally filtering a saltwater aquarium shows how an aquatic environment can thrive extremely well when we allow Nature to function on its own. These visually inspiring filtration methods, along with the beautiful display of sea life, could help one better appreciate and connect with Nature. Riddick (1985). “Health, Aquariums, and the Non-institutionalized Elderly”. DeSchriver and Riddick (1990). “Effects of Watching Aquariums on Elders’ Stress”. Gaidos, Susan (2009-08). “Study: Aquariums May Pacify Alzheimer’s Patients”. Barker, Sandra, Rasmussen, Keith, and Best (2004-07-05). “Effect of Aquariums on Electroconvulsive Therapy Patients”. Pretty and Barlett (2005). “Nature and Health in the Urban Environment”.